Manuel Adalid Anniversario Classical Guitar #62 Spruce – Double Top – Elevated FB – Alessi Machines – Major Discount! The Anniversario guitar is mighty special, on a class with the powerhouses of this generation. Celebrating 50 years of building from 1957, Manuel has built select few of these guitars, this particular Spruce Double Top being #62. Double Top with Nomex, utilizing the ultimate in Manuel’s experimental tech, this guitar really tells you something immediately. I wrote earlier about the Cedar Double Top Anniversario, which I really loved. The Spruce is a brighter, more piercing instrument, highly suited to Baroque, Rennaisance music as well as the classical and modern repertoire. She already sounds great, and I know that she has more to go and mature as the Spruce relaxes over time. Still, very loud, very musical, and seriously nice all around. Recording it today, it’s a scary thought that she still has more to grow and mature. The guitar was so bloody responsive in my hands. Seriously nice. Manuel treats his Spruce in such a way that it appears older, much like you see on historical instruments. It is a highly specialized thin lacquered finish that ends with a curing and catalyzing process that is unique to Manuel’s shop. The Nicoló Alessi Tuning Machines are a superb touch, being among the finest machines in the world, very smooth and quite elegant. The Madagascar Rosewood is a wonder to behold, being of dark red, rich ruddiness, streaked with deep chocolate browns. Manuel uses nothing but his best stock of old seasoned woods to create his singular creations of this level. 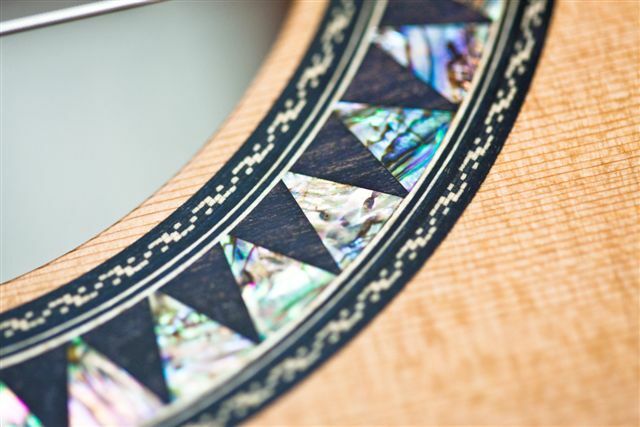 Killer Rosette work with Mother of Pearl Inlay. Manuel is just showing off now, while the headstock has that German nuance to it that you see in the best luthiers from Northern Europe. Loving these guitars. btw, no edits, no processing of any kind, not even noise reduction. Just a touch of reverb, which you can hear in my voice. Literally plugged the mics in and started recording, flubs and all.